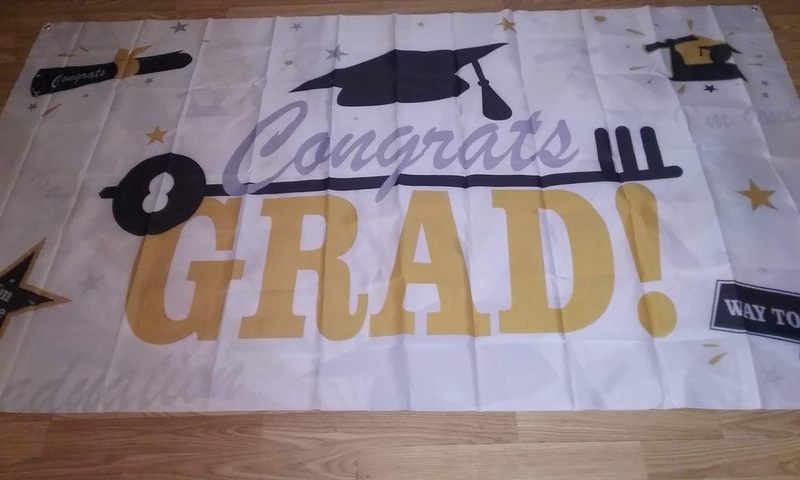 Graduation season is nearly here, I just got this Graduation Banner. My grand daughter is soon to be graduation from high school and I thought this would be perfect to decorate for the party. It measures 78" x 45", and it's made from oxford material so it's durable enough to be put away and used again for any other upcoming graduations. I really like that there's no year on this banner so it can be reused. It's very festive in appearance , making it perfect for any graduation. It can be used indoors or outdoors because of the oxford material it's made of. This banner can be used inside or outside. Can be hung using the 4 grommets or it can be hung using tape (not included). It's versatile, it can be used as a photo booth background, a tablecloth, or hung on a wall fence. tree, etc. Perfect for high school, college, nursing school, doctorate , or any other graduation.